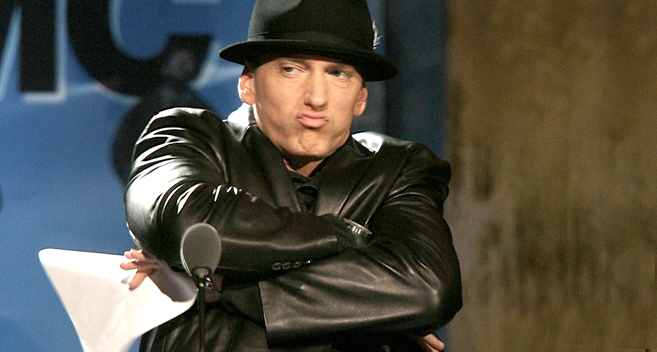 In his new rap album Revival, once-relevant white rapper Eminem — real name Marshall Mathers — says it has been occasionally “embarrassing” to be white and he even considers killing himself because he “can’t escape this circumstance.” Have you tried not judging yourself by your skin color, Marshall? In his song “Untouchable” he raps that “there have been times where it’s been embarrassing to be a white boy,” according to Chris Menahan at Information Liberation. I would think it’s more embarrassing to be a wealthy 45-year-old rapper still dressing and scowling like a hard-done-by street punk. “I feel like checking out on life, can’t escape this circumstance,” he says. He can’t escape being wealthy and famous. Tragic.